Lies Our Hearts Believe–and Truth that Sets Us Free! I’m so excited to share some fun news with you! 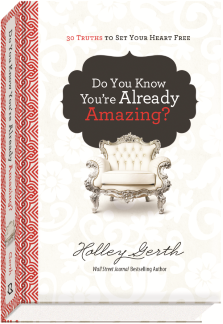 I have a new devotional releasing next week called Do You Know You’re Already Amazing? 30 Truths to Set Your Heart Free. It’s a sister book to the Wall Street Journal bestseller You’re Already Amazing but it is all new content. I nod in understanding and feel a fierce longing to reach through my computer screen and wrap protective arms around every person who has left a comment. Our battle against the lies our hearts believe goes all the way back to Eden. The enemy tempted Eve with the question, “Did God really say . . . ?” That phrase is the tip on every sword of untruth. And he still uses it to pierce the deepest parts of who we are. Did God really say you’re loved? Did God really say you’re enough? Did God really say He has a good plan for your life? Before we know it, the lies slip in and our joy, peace, and sense of purpose slip out. But we don’t have to live that way. We belong to a Savior who promised, “You will know the truth, and the truth will set you free” (John 8:32). Preorder Do You Know You’re Already Amazing? now. Holley, will this book be available for my kindle? Looking forward to reading it and sharing with the other amazing women in my life. Your devotional looks great! I’m going to check it out! This book needs to be in our church library! Thanks for hosting the linkup! Loved listening to your live video conference with Suzie and Jennifer Renee yesterday. You ladies are a true blessing and inspiration. Hugs to you all! Congratulations, Holley. I loved You’re Already Amazing, and I’m certain I would love this one, too. 🙂 Thank you for all your encouragement to us women who feel invisible, inadequate, and insecure. Hugs! How exciting! Love the sneak peek, Holley! Definitely adding this to my list. I loved your last devotional — What Your Heart Needs for Hard Days — and have purchased it as a gift for several friends who needed encouragement during a valley season. I just did an art journal page and what I wrote on it was that I felt invisible!!! I’ll be getting your book!!! When the truth renews our mind and takes root in our heart our lives are powerfully transformed! Congrats! Yes to truth 🙂 Blessings to you and may many be encouraged by your book. Holley, I can’t wait to get my hands on this book! I’m planning a Bible study using your book and life growth guide. What a beautiful gift this might make for each of my ladies! Thank you for hosting! I love reading some of the posts shared (wish I had the time to read all of them). Congratulations on your book release, praying all will go well. This sounds like an amazing and encouraging devotional!